While plowing snow yesterday with the 2n the engine at times would slowly shut down and I would be able to restart it and it would run for awhile and slowly die again. So the next time it happened I pulled the plug on the carb to check for fuel flow which seemed alright, if I backed the throttle off just as it wanted to quit it stayed running......fuel screen plugged? Fuel flow should be 1 pint in 2 minutes. What 'seemed' ok to you? I concur with HFJ, it sounds like a fuel issue, but as per stated, fuel and spark tests need to be performed to determine the true root cause failure. I have to ask this because sometimes it is the basic simple things that get neglected or forgotten. Is there enough fuel in gas tank? Is the fuel sediment bulb valve open 2-FULL TURNS when in use? Anything less than 1 gallon requires the valve to be open all the way to access the reserve flow. Do you shut off the fuel sediment bulb valve when shutting down the tractor? 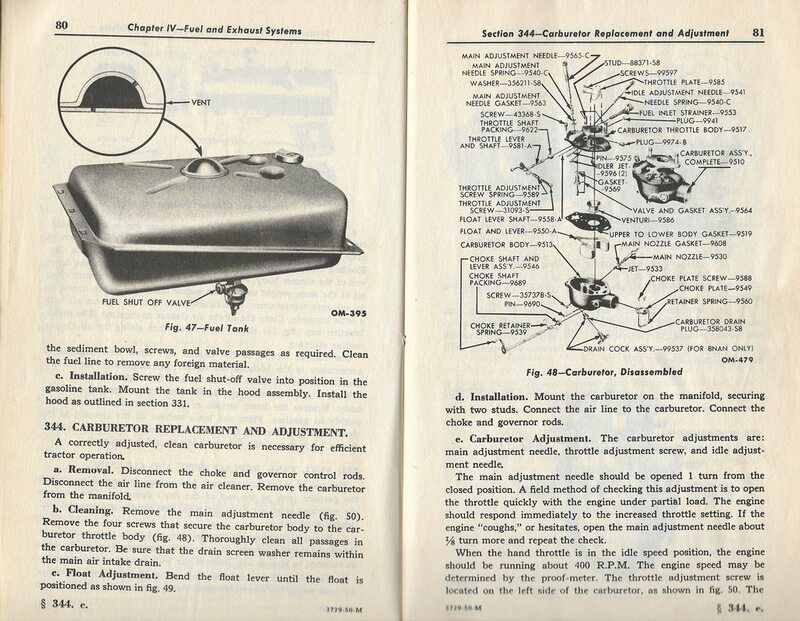 CAUTION expressed: Do the fuel flow test with a cold engine, and before the spark test. You don't want to be making sparks if any fuel is present. Do this: Engine OFF and COLD, with the valve stem closed, place a coffee can or other container underneath the carb to catch fuel. 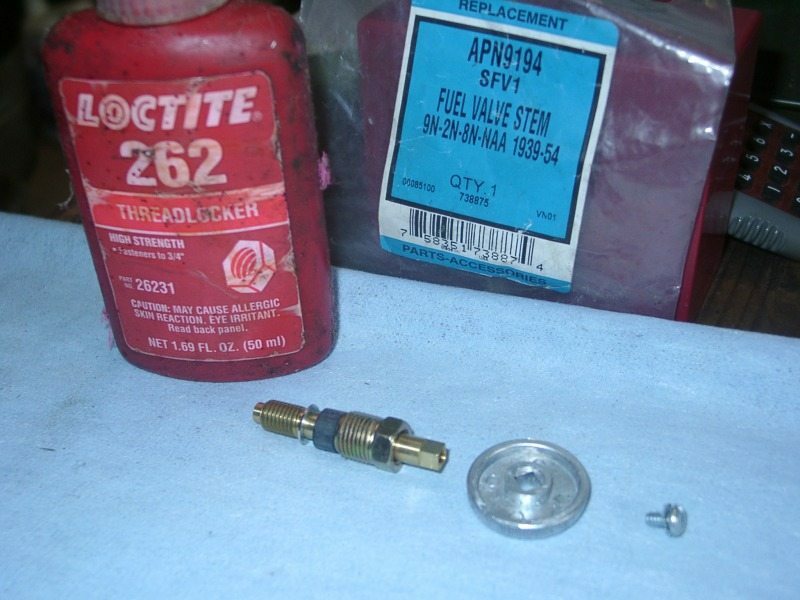 Using a box end wrench, loosen and remove the carb drain plug. Drain plugs should be brass so avoid using pliers, channel locks, or a pipe wrench to remove. If plug is boogered up/rounded off, you may need vise-grips to remove then plan on replacing it with a new one. Open the fuel sediment bulb valve 2-Full Turns. Observe that fuel flow thru the drain is strong, without any hesitation, and yields 1 pint in 2 minutes. Running longer will help conclude if a possible intermittent blockage occurs. I always do this while rocking the tractor. This sort of puts it in normal operating conditions in the field, as bobbing up and down can cause lose/floating debris in the gas tank to block the fuel inlet ports. If no stopping and starting or hesitation of fuel flow is present, chances are good you can eliminate a fuel flow issue. If the fuel flow is weak, hesitating, stopping and starting again, there is a blockage somewhere in the system. Now it must be determined where that blockage is. There are a few places and could be one, two, or any combination of them all. At this point, try opening the gas tank cap. The OEM cap is not vented and often can cause a vacuum lock. Note I said vacuum lock and not a vapor lock. They are two different animals. A vapor lock can only occur in systems that use a fuel pump and N's do not use a fuel pump so it is almost impossible to have one in these updraft gravity fed systems. The N gas tank has a vent dome on the top center with a small 1/16" hole. It will get plugged up over time and the only way to unplug it is to remove the gas tank which is a big project since the tank is connected to the hood. This vent if plugged can cause a vapor lock. If removing the cap makes no difference in fuel flow, then move on to the next step. 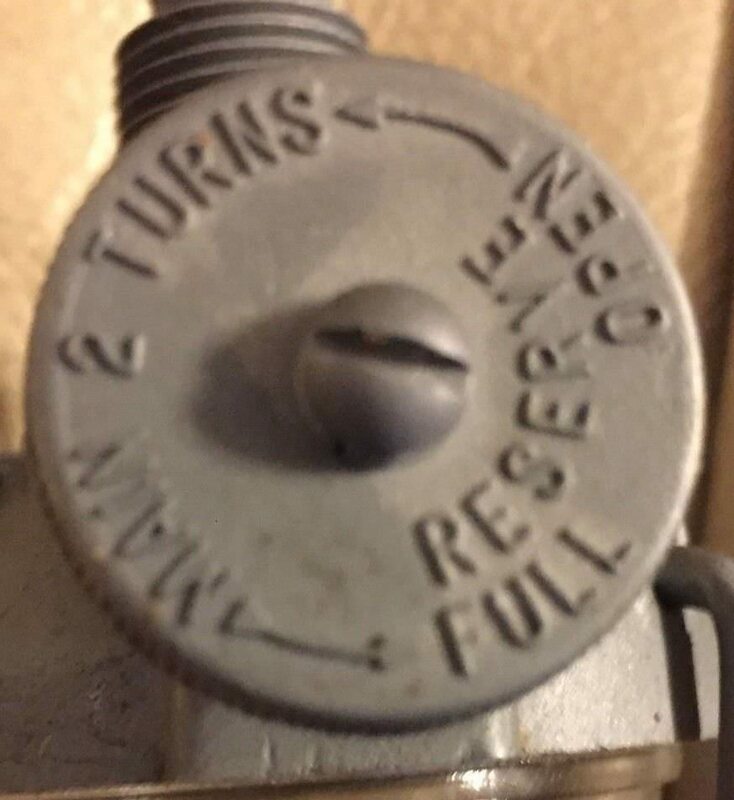 Close valve. Using a 7/16" Flare Nut wrench, loosen the fuel line at the carb brass elbow inlet. Gently lift the line up and out of the way off to the side of the elbow. Using a good wrench, a Crescent-type adjustable will work; loosen the brass elbow on the carb. Gently pull it out -it has a screen attached at the end so be careful. Observe if it is full of debris -that is why it there. Soak it in a can of carb cleaner. Now, with the coffee can still in place, open the fuel sediment bulb valve 2 Full Turns. Observe if fuel flow passes 1-pint test. Yes? Problem is not in carb. Close valve, replace the drain plug. Clean the brass elbow screen but be careful using compressed air to blow it out; it may be too much and destroy the screen. Replace the elbow and insert the fuel line using fingers to tighten so as not to cross thread. Fuel lines and brake lines use special threads, a 7/16-24 UNS so if you booger up threads, you will need new parts. Next, repeat the fuel flow test with the drain plug removed. 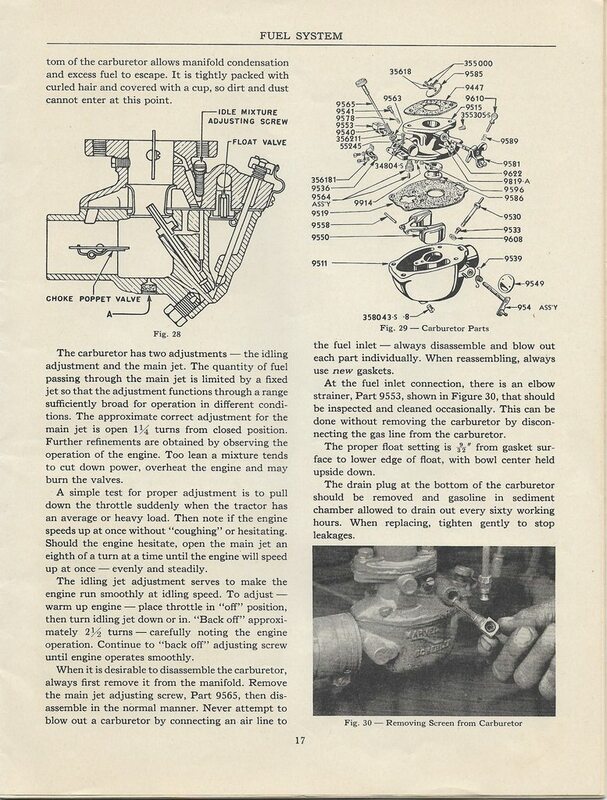 If still hesitation, problem may be in the carb float being stuck. That requires removing and rebuilding. Always rebuild OEM parts whenever possible and avoid buying any of the new aftermarket stuff. One last possibility is in the Fuel Sediment Bulb Assembly itself. There are two screens in it. One is fine mesh, brass, round piece that fits horizontally in the bottom of the assembly. It has an offset square hole that fits over the inlet port. The glass bowl uses a cork gasket. New ones have rubber but some are junk and will leak. See diagram below. The third screen is on the top of the assembly, vertically on the fuel inlet port �the portion that is up inside the gas tank when fully assembled. It is possible one or both of these screens is severely plugged. If you must remove the entire bulb, cleaning is a delicate job. That vertical screen was originally soldered on so is pretty robust. New aftermarket units simply glue them on so it doesn�t take much blasted air to get them to come off. There is no need to replace the entire sediment bulb assembly unless this happens. The only wear part on the assembly is the valve stem. New ones, p/n APN-9194 are sold for about $6, more from the greedier part dealers. The valve stem has a rubber seal on it. Over time it will get chewed up and cause leaking. I also advise to use a dab of thread locking compound on the little 8-32 screw that secures the knurled knob on. 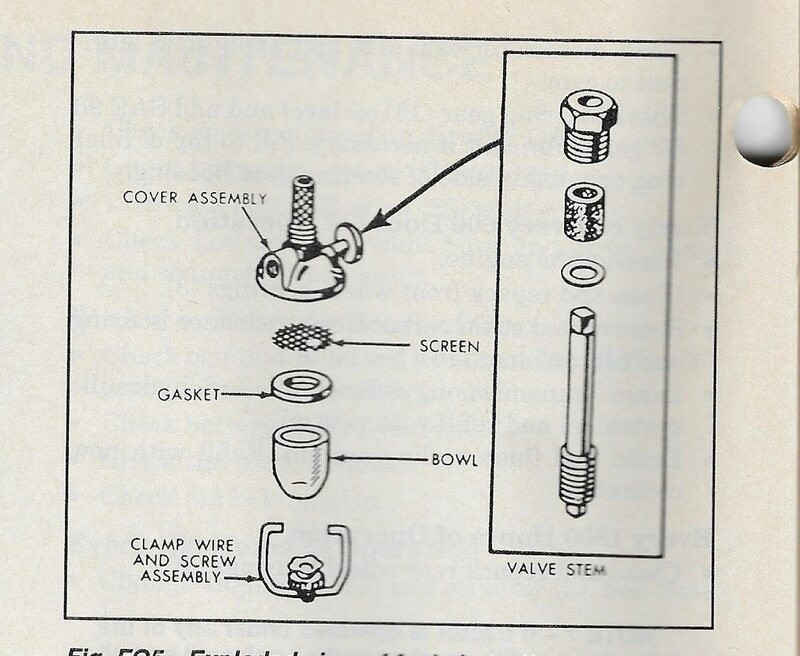 The knob and screw are included in the new valve stem kit. You have no need to ever remove the knob until the next valve stem replacement and then you only need to repeat the process. Why all this? I found out a long time ago, mostly on poor aftermarket parts that the knob will fall off as the screw loosens itself up in the field running the tractor. You don�t realize it�s gone until you get back to the barn and go to shut off the fuel and it�s gone. Finally, I advise to never use Teflon Tape, pipe dope, or other band-aid substance if you have fuel leaks. Locate the problem and fix it correctly. You don�t want to be second guessing if your fuel will leak do you? I know I don�t. next time it does, try to start adding choke.. if choke helps or keeps it running.. it is usually fuel. if it don't help, try jumping around key switch.. might be something heating up killing spark. See tip # 13. Check for spark and fuel as soon as it stops running not 5 minutes later. If it's a spark issue, check for moisture in the cap. Coil and cap gaskets are important in a front distributor. That's got to be frustrating. You say you are able to restart it, but does that mean it starts right back up or do you have to work at it or wait a few minutes? Then you said you pulled the plug to check for fuel flow which SEEMED alright. Did you get a pint in a couple of minutes? Like the others said, it sounds like fuel starvation, but you have used this tractor many times without the problem. Another possibility, is a weak spark. The next time it happens, hop off and feel the coil, and see if it feels too warm. My NAA used to do just what you describe. I did all the fuel flow trouble shooting issues, and never fixed it. I finally put on a new coil, and it never did it again. Another clue is when you back off the throttle you can save it, which could also be weak spark. It will start right up, no wait time. Once for sure I heard the sound of fuel flowing, tried the cap a couple of times, to no effect, I might not have been fast enough though. I have plowed with this tractor for a number of years, it's possible, just never had it happen.